Celebrating Those Who Have Returned From Sea, Mourning Those Who Will Not. 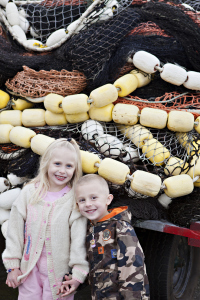 George and the crew have returned from the 2014 Dungeness crab season. I have not yet gone down to the harbor to snap pictures of the post-season gear work that consists of getting 500 pots off the boat, stacking them in lockers at the harbor, and a variety of other tasks. This year’s crab season was not great, as there were very few crab around. The upside is that George said there were many “recruits.” Recruits are all the female and young crab the guys throw back into the ocean. 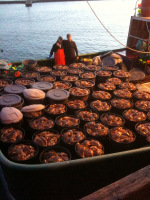 These crab indicate a potentially boom season in the next couple of years. Fishing seasons run in cycles, and we don’t get too upset about a slow season, knowing it will come back around as it always does. The important thing is that everyone arrived home safe and alive. You never know, when you wave the boat off at the start of a season, if that will be the last time you see one of the guys you are waving to. Without fail, I go to the harbor and wave and hug and send the boat off at the start of every single season, because you just never know. 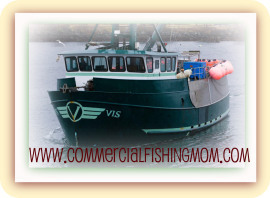 Tragically, the Oregon commercial fishing community will not receive one of their fishermen home this year. 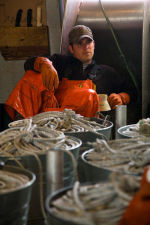 Just last week, our sister fishing community lost one of their own to the Bering Sea. Eric Eder, who by accounts from every single person in the Oregon fishing family was an upstanding, awesome, fun, friendly, wonderful man, leaves behind a beautiful wife and young family. You can read more here. This hurts everyone. Personally, news like this always causes me to reflect back to 1997, when my own brother-in-law, Danny, was lost to the sea during the Alaska crab season. Married just a few months, my sister’s vibrant and exuberant husband was never found. I’ve written a bit about Danny here. I have never shared much about the grief of our families on my blog or otherwise, because the grief is so private and painful. However, I will never forget going about my regular morning all those years ago. Then, the phone call. The panic. The confusion. The denial. The hope that it was all a mistake. The realization. The horror. The fact that another family is experiencing this right now leaves us all with a heavy heart. 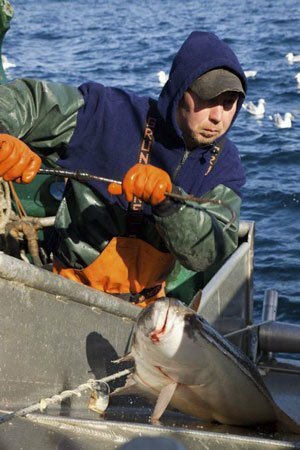 We welcome and celebrate the fishermen who have returned safe to the harbor, but mourn the ones who will never return. We cry for their wives, their children, their families, their friends. And please, don’t forget the Lady Cecelia. 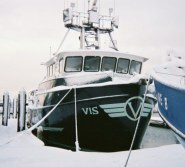 Just two years ago, in March of 2012, I wrote about my thoughts concerning the tragedy of this Oregon trawler that disappeared into the sea in a matter of seconds off the Washington Coast, taking all four crew members with her. You can read that post here. If you are able, I encourage you to take a moment and give to the family of Eric Eder. Donations can be made here. 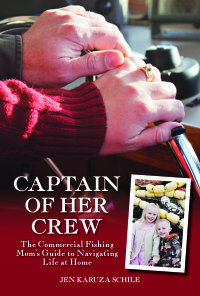 Imagine if you were a fishing wife one moment and a fishing widow the very next. 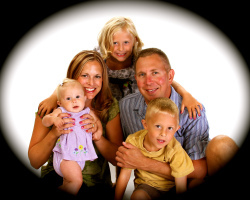 If financial giving is not an option, please pray for Eric Eder and his family. I can tell you that time does not do much to ease the excruciating pain of a fisherman lost, but every little bit of kindness, love, and support does help. One subject I don’t spend a lot of time writing about on this blog, although it’s a blog about fishing families, is the ever–looming threat to fishing families of deaths and disaster at sea. You may have heard by now about the Lady Cecelia, a trawler out of Oregon, that went down (sank) in a matter of seconds seventeen miles off the coast of southern Washington, taking all four crewmembers with her. Unless you have a direct tie to commercial fishing and fishermen, you may have shrugged off the story and the catastrophe as just another boat, just another crew, just another run of bad luck in the industry. But when you are profoundly connected to the industry and you look at a picture like the one included in the article, you stop. You stare. You look intently into the face of one of the men that was lost and you see your own husband, your dad, your brother. If you are a fisherman, perhaps you halt for a moment, seeing yourself. You continue to look at the picture and see the two-year old boy, dressed just like his daddy in Xtra Tuffs and orange rain gear, sitting on Daddy’s lap on the boat. Your heart overflows with grief and sorrow that this daddy, whom the child clearly adores, is now lost. Maybe in the little boy you see your own little son or daughter, your grandchild, or your nephew. One reason I don’t write much about the potential for and reality of tragedy in our profession—one of the world’s most deadly professions—is because I can’t. The thought is always in my mind as I go about my day and drift off to sleep at night. 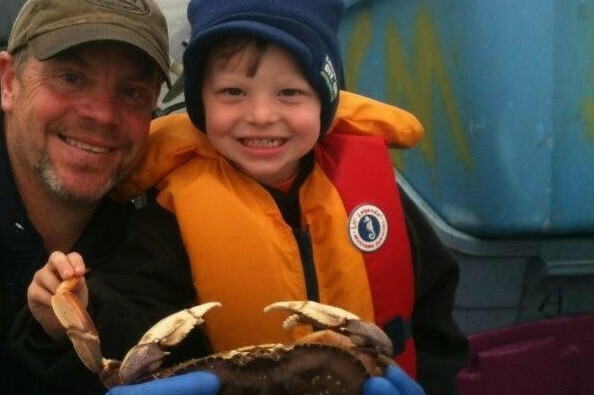 Having already lost my brother-in-law fifteen years ago to the sea during an Alaska crab season (you can read a bit about him here), the memory of that horror and disbelief lives on in my heart. I don’t like to bring it to the forefront by writing often about it. As a grandchild, child, wife, sister, and mother in a fishing family, and as someone who has actually fished, I have to get distance from the risks and possibilities. I can’t dwell on the “what ifs”. I have to stay focused on the day-to-day; my children to care for, a household to maintain, pets to feed. I stay busy with my children, my activities, my friends, and family. Sometimes, though, I wonder. What would I do if I received word that George was lost? If one of the crew was lost? If the entire boat was gone? How would I tell our children? What would I tell them? How would we ever continue? I think of the practical aspects. Would I keep this house and find comfort in the memories and familiarity of it, or would I find it too large, too sad, and decide to sell it? What would I do about the business-end of things? 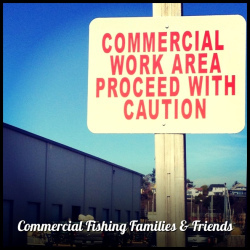 Our operation is rather involved and complicated, especially for a family fishing operation. Would I understand how to handle the IFQs? 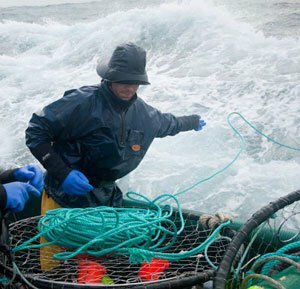 What do I do with hundreds of crab pots, a locker full of longline tubs, lines, seine nets, gear, permits, documents, and loans? Besides family, who would I trust to understand and help me in these matters? I was in my early 20s when my brother-in-law, Danny, died. He and my sister had recently been married and they did not have children. All these years later, I still remember the way well-meaning family and friends, all who’d come to lovingly offer us comfort and condolence, spoke quietly among themselves. I remember one comment I heard again and again. As I heard this repeatedly over the days and weeks following the accident, I wondered about it. I’ve continued to wonder about it through the years, going over the comment in my mind and looking at both sides. What would be worse, I’ve wondered? Having to look into the precious faces of your young ones and tell them they no longer have a living father? Would it be better to not suffer that grief? Or is it better to have a living piece of your spouse still in the world in the form of little ones with his laugh, his expressions, perhaps even his character? Last night, our children (Eva, 6, and Vincent, 4) overheard bits and pieces of George and I quietly discussing the tragedies of this week (a total of six fishermen in separate accidents who died at sea on the Washington and Oregon coasts). In particular, the children wanted to see the picture of the fisherman and his son; we did not show it to them. We knew that if they saw the picture of the fisherman sitting on the boat with his little one in his lap, they would see their own daddy. They would see the other fisherman daddies they know and love; Bryan, and Brett, and Johnny, and Oscar. If they saw the picture of the little boy, they would see themselves and each other. And they would be scared, and they would cry, and they would worry. But I’ve looked at the picture dozens of times. I choke back tears in silence away from the children, because only the mommies and the daddies should worry. We may keep that worry in the back of our minds or deep in our hearts, we may not talk about it, and we don’t often write about it, but we do. We worry. I’m Pretty Sure the Crew Doesn’t Cry Over Broccoli. I don’t think anyone is more excited than me for the iPhone 4S to make its début on Friday. I’ve been eligible for an upgrade for at least two years, but I’ve put it off because I kept waiting for iPhone 5 to come out. Well, the heck with more waiting; the 4S is going to be amazing and I’m clearing my schedule for Friday so I can go get the phone and then play with it all day and night. 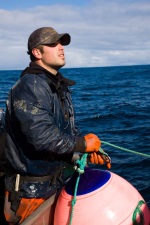 George has continued work on the boat every day to get a jump on it before the Dungeness crab crew shows up. In fact, he just warned me today that he’s working this weekend as well. I’ve tried to get him to stick around the house and hang out with me a bit now and again when it’s nice and quiet and the kids are at school, but no dice. The boat’s still hauled out, paint has arrived, the welder is coming…. I have already consulted with my parents, though, and they are going to have the kids over one weekend before crab season starts and the baby arrives. In fact, my mom put it on my kitchen calendar herself. I’ll be sure and give G plenty of advance warning. If he still can’t make it, I’ll just pack my little bag and head to the nearest fancy hotel for a spa day and a night of fine dining and rest. It occurred to me the other day that having your firstborn in kindergarten is a lot like when your firstborn was a newborn. Like a brand new mom in awe over her baby, I’m so proud of everything Eva is doing. Look, Eva is the line leader for the field trip! Awe; look how cute she is in her jeans and cowgirl boots! Look how she gets off the bus! Oh, that’s cute! She’s checking out library books! She’s leaving little notes with practice writing all over the house! What a sweet, smart girl! Remember how the hospital photographer comes around before you leave with your newborn and you study the portrait packages, agonizing over which one to choose? That’s how it went yesterday with Eva’s first official school pictures. As I did when she was born, I went a bit overboard on the package and the extras. If you are on my Christmas card list, be prepared to receive a wallet-sized picture of Eva. Or a mini-wallet-sized picture of Eva. 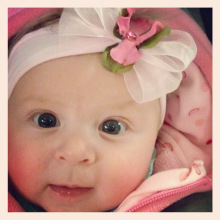 In fact, I have so many pictures of Eva coming I could send one to all my Facebook friends. Or…I can provide you with a refrigerator magnet of Eva. How about a bookmark of Eva? Door hanger? Sticker? Better yet, if you receive Christmas gifts from me, you may well have an Eva gift tag attached to your present this year. Not to be left out, of course, is my sweet buddy, Vincent. I’m constantly amazed at the growth he’s shown in his first month of preschool. For the first time, he’s showing interest in art and receiving compliments on his work. He’s recognizing his name and attempting to write it. He’s memorizing and singing all the songs he learns. And just yesterday, while bike riding with Grandpa, he mastered pedaling and balance without training wheels or assists. He even accompanied Eva’s kindergarten class on their field trip to the fire station and I was so proud of the way he listened so well to the firemen, raised his hand to ask questions, and walked with the group in an orderly fashion. 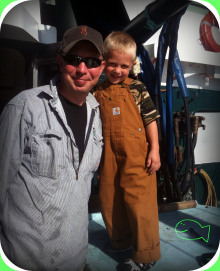 Vincent is determined to work on the boat and be “as big and strong as Daddy” when he grows up. We used this to our advantage at the dinner table this week when Vincent refused to eat a nice dinner (prepared by G, of course). “Wow,” I said. “You know that you won’t grow up to be big and strong enough to work on the boat with Bryan and Brett if you don’t eat your healthy food, right? George chimed in with a couple of words about sending people who complain about dinner into the hatch to finish it up, but that only made us laugh. Eventually, Vincent did eat his entire dinner. Will be back tomorrow with a report on the new iPhone 4S! Can’t wait!